Whether you’re on a motorway or country road, a car breakdown can be a very stressful situation, but don’t fret because we will be one phone call away to provide you with the fastest roadside assistance service at any time, day or night. Simply by keeping our number in your car or saved in your phone, you can have peace of mind no matter where your journey may take you, knowing that if your car does breakdown, you’ll endure the least interruption to your schedule possible, for the best possible price. Swift service, efficient in an emergency. Our goal is to remove the stress from vehicle breakdowns and aim to get to you within forty minutes; we will see that you’re back on the road and continuing your journey as fast as possible. Our wide range of vehicles that cover the greater London area and the M25 motorway ensure that no matter the time, of day or night, we’ll have someone nearby ready to assist you on the roadside. The best services with the best vehicles. All of our vehicles whether they are tow trucks, hire cars, or flatbeds are modern and up-to-date, ensuring that you feel a sigh of relief as you see our reliable mechanics approaching. We make sure that our tow trucks are kept in the best possible conditions, so that you know your car will get the best care, and the replacement vehicle we supply you with will have no chance of breaking down. Fast roadside assistance, only one call away. With just a quick call to our customer service we can dispatch our expert mechanics immediately, all we need to know is your location and what car you drive. By letting us know the make and model of your car, we’ll not only be able to provide with the most appropriate roadside aid but we’ll also strive to supply you with a close match as a replacement. Location. 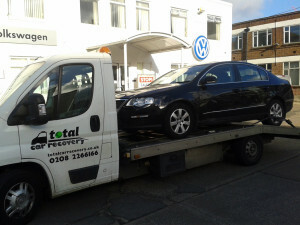 We cover all of London and M25 Motorway. No matter where you are in London or around the M25 we have a team of professionals specially situated to aid you on the roadside in the quickest time possible for the most affordable rate, now you really don’t want to leave home without our number! Excellence in both transport and car repairs. If you’re on holiday and prefer to use your local garage for repairs, we will transport your car to your preferred destination, or to a nearby garage of your choice. However, bear in mind that our affordable prices and excellence in customer service also spans across to our garages where we can repair your car whilst lending you a replacement, ensuring the least interruption to your day or night possible. Professionals. We take pride in our employees dedication and professionalism! After your house, your car is the most valuable commodity you have, and if it’s broken down, you will be all too aware of how much you rely on it for its convenience and safety. You can sleep easily knowing your car is in safe hands with trusted professionals that will fix your car to the highest possible standard whilst treating it with the care it deserves.